An eyewitness and taxi driver at the scene of the London Bridge attack this evening said he saw ‘three men’ with ’12 inch long’ blades. A van came from London Bridge itself, went between the traffic light system and rammed it towards the steps. It knocked loads of people down. Then three men got out with long blades, 12 inches long and went randomly along Borough High Street stabbing people at random. Another eyewitness told the BBC that he saw men ‘running and stabbing everyone’. A witness near Borough Market has reported that armed police fired shots into Brindisa tapas bar in the market. The man also reported a crushed van in front of Brindisa in the second major incident to hit the capital in a couple of hours. Police have confirmed a major incident in Borough Mark after a van mowed down a number of civilians on London Bridge. 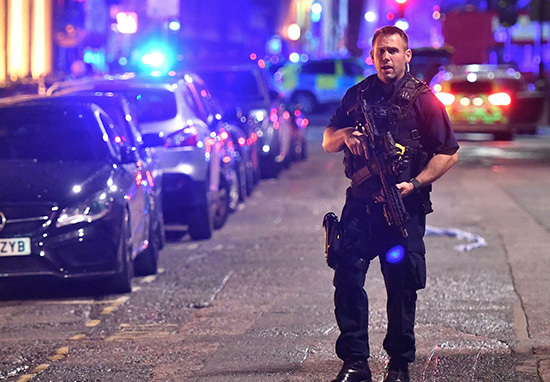 A former military officer who was witness to the London Bridge attack this evening reported hearing ‘tremendous gunfire’ that ‘went on for quite a few minutes’. Speaking to Sky News, the witness said there was ‘rapid fire’ which he initially mistook for fireworks because of how long it lasted. He also reported that the police response took about 10 minutes after the shots were fired. A white transit van mounted a curb on London Bridge and hit pedestrians, according to the Metropolitan Police. The Metropolitan Police have asked the public to avoid the area at this time.